Next Tuesday the SECollective are very excited to welcome Kristian Borring’s stellar quartet to the Amersham Arms; there was an absolutely incredible atmosphere this week for Pickpocket’s first gig and next week promises to up the ante! 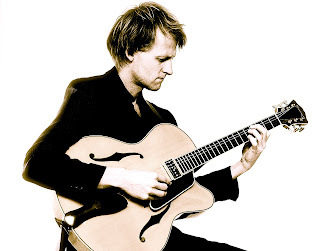 Danish born Kristian Borring has built his name as a skillful guitarist with great melodic sense and sophisticated harmonic understanding, equally mastering the standard repertoire as well as original material. Kristian is currently working on his second album, set to be released during early 2014. The recording is meant as a personal homage to the experience of the life in a metropolis and will released on Yellymould. It features an outstanding lineup of some of the UK’s most exciting jazz musicians: Jim Hart (vib), Arthur Lea (pno), Mick Coady (bs) and Jon Scott (dr). The band toured in late 2012 before recording and packed out the Hoxton venue, Charlie Wright’s, for their appearance at the London Jazz Festival. When not busy with his own projects, Kristian appears with the innovative SECollective in bands such as Acrobat, Draw by Four and is also in a long lasting work relationship with the lyrical jazz/folk vocalist Monika Lidke. He was nominated in 2012 for the “Take Five” project run by Serious and has worked and performed throughout the UK and Europe with a great range of groups and performers, including Antonio Zambrini, Will Vinson, Tommaso Starace, Laurence Cottle, Archie Shepp, Ivo Neame, Jim Hart and Gareth Lockrane. If you can’t wait an entire week for your next SECollective 'hit', you can join us at the opening LUME night at Hundred Crows Rising in Angel this Thursday 4th July. We are presenting two terrific bands; Redshift (Trish Clowes / Andrea Di Biase / Patrick Davey) and Identity Parade (Alam Nathoo / Tom Hewson / Peter Ibbetson) – who have new video!